Unlike the movies from the 1980s would lead us to believe, wiping a hard drive doesn’t remove the information from it and keep the bad guys from figuring out your next move or stealing company secrets. Just wiping a drive may leave tons of personal and company information available to someone with the right tools and knowledge. Turns out, we need to start taking those other movies from the ‘80s, where hackers could access anything no matter how “clean” it was made, a lot more seriously than we thought. 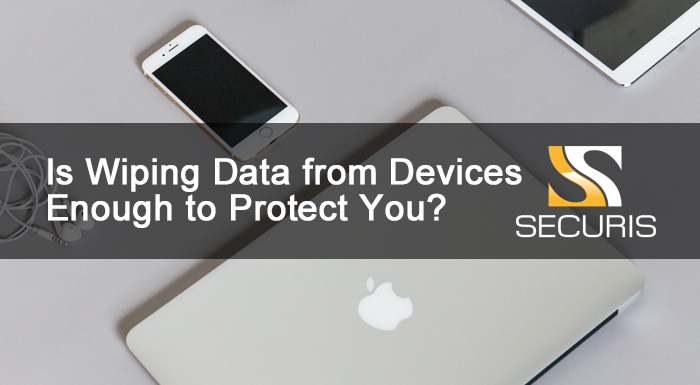 In one of the largest reviews of used devices that were allegedly scrubbed of information, the National Association of Information Destruction (NAID) found personal information on 40% of these devices. NAID looked at a wide range of electronics including what you most likely use in your office right now: smartphones, tablets, and hard drives from PCs and laptops. According to the report, the big trend is that people aren’t successfully wiping their data using standard tools and information. And, that 40% of is a pretty terrifying number when you think of how many millions of devices that includes. One surprising part of the NAID report is that commercially available tools actually can remove all of the personal information from a device like a smartphone or laptop. What you have right now, when used thoroughly and correctly, can protect you. The problem lies in following complex steps and troubleshooting when things go wrong or when additional steps are needed. The average person, and even the average IT professional, assumes they can do it all themselves correctly, without always following up or verifying that the procedure was successful. In many cases, they also lack the equipment necessary to verify a complete wipe. The tools that come on your devices are supposed to be used as one step of many. Inherently, they can only attempt to remove information; they cannot check and verify information has been completely removed, especially in the event of a malfunction. And one of the big reasons we get new phones, tablets, laptops, and PCs is that they have already started to malfunction in other areas. So, you can’t expect them to then work properly this one time when you need it the most. NAID recommends using a professional to destroy your equipment and remove your data. We couldn’t agree more. Lost and stolen data costs small companies in the U.S. hundreds of millions of dollars each year. Larger companies pay out even more and face greater penalties and regulatory concerns. On its own, Target is still paying out costs from a 2013 holiday shopping season breach and its costs have surpassed $300 million so far. Safety isn’t just in wiping your hard drive, it’s about properly handling them. If you’re looking to sell old hardware assets, we’ll also work with you to remove the hard drives and other parts that can store data, destroying these and allowing you to safely recycle other parts that don’t pose a threat. The good news is that you can safely perform the data destruction you need at an affordable rate. The even better news is that with the right partner, you might even have a chance to get it done at your site, under the care of professionals and the supervision of your staff. Ready to learn what you can do to protect yourself? Contact us here for a free review and to understand what it will look like for your company to keep customers, clients, and personnel safe.